Commercially zoned 4.66 acres on Highway 287, located between Sunset and Alvord in a prime location. Constructed in 2012, main building has 4,500 sq ft of shop space, with six 14&apos; x 10&apos; bay doors, office & storage room, plus an additional 2,000 sq ft of finished space that has CH/A, four offices, large receptionist/meeting room, small kitchen and men & women&apos;s bathrooms. Security system, internet & additional storage; building also has a 25&apos; awning. 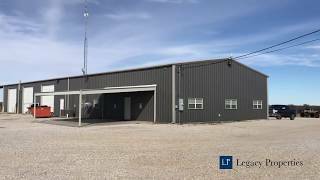 Additional 30&apos; x 50&apos; barn with concrete floor & roll up door, interior office. Fuel tank on site too. 4.66 acres of land, most of which is graveled; whole perimeter has security fencing with two gated entrances. 470&apos; permitted water well, septic system, electricity on site.